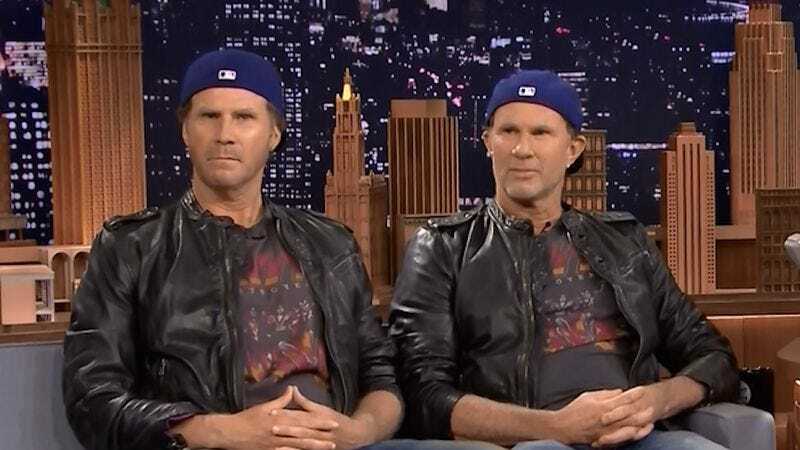 After the good-natured feud between Will Ferrell and Red Hot Chili Peppers’ drummer Chad Smith came to a head, the doppelgänger duo took to settling their differences with a charity drum-off on The Tonight Show. And now that peace has been reached, they’re ready to open the challenge to other celebrities and drummers they sort-of resemble: In a recent interview with Spin, Ferrell and Smith called out Metallica’s Lars Ulrich, with Ferrell noting that “Lars gets pissed because he gets mistaken for both me and Chad Smith,” and inviting him to come and settle the matter on the drum kit. Ulrich has yet to respond, but—as we were reminded by his recent flailing around in response to a petition from attendees of the Glastonbury festival to have Metallica removed from the bill—the perpetually on-edge Ulrich is always more than willing to take on challengers. And if not, he could always just take a page out of Ferrell’s book and have Questlove fill in for him.